Support the long-term sustainability of our trails by doing your part to keep them safe, clean and enjoyable. If you experience a road condition you feel is just not right, there are people who want to know about it… the Public Works professionals who serve each jurisdiction. Here’s the contact information for the folks at the County and for each of the towns. 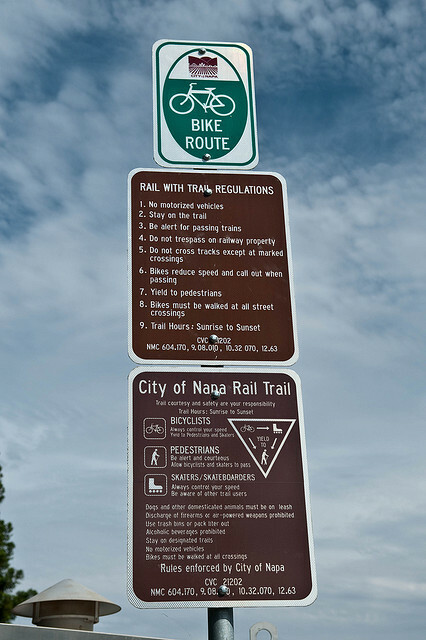 Soon, a mobile app will be available from the NV Vine Trail that will include a reporting tool for all jurisdictions. American Canyon: The City of American Canyon has a problem reporting tool on their website for residents and visitors alike. The phone number of public works is 707-647-4550. Calistoga: The City of Calistoga does not have an online reporting tool, but they do have a complaint form on their website you can complete and fax to 707-942-9472 or email pworks@ci.calistoga.ca.us. Or call 707-942-2828. Napa: The City of Napa has a pothole reporting tool on their website for residents and visitors alike. Call Public Works at 707-257-9520. Napa County: The County of Napa has an online question tool for public works on their website for residents and visitors alike. The phone number of public works is 707-257-9520.